Experimenting with sous vide tempeh was a little more of a challlenge than I expected, but it seems like with every new cook – it gets tastier. The first time I sous vide tempeh with my beloved Anova, the texture was too firm and it was tasteless. It was cooked at 180 for 2 hours. It was my first time cooking tempeh in general, so I didn’t have any concept of its texture or taste. The second time around – the texture was just right. It was cooked at 190 degrees for 2 hours. However, it was still tasteless. I only added a bit of salt and soy sauce, but not enough to make the tempeh take the flavors. It was severely plain, and I had to make up for it during the searing process. It was okay, but it wasn’t going into the kitchen for seconds. 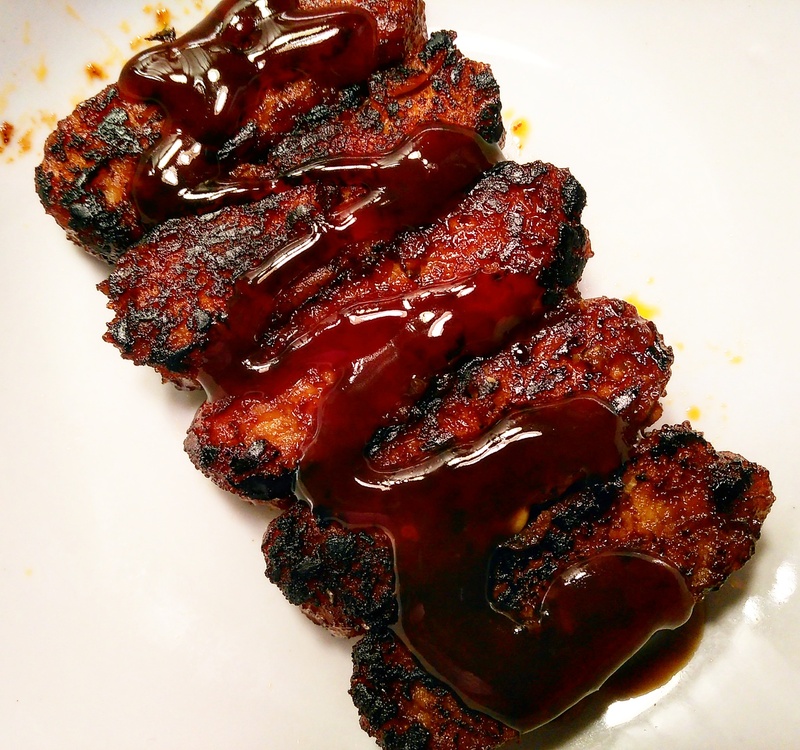 This time around, I decided to add a generous mix of BBQ sauce and oil – I did not hold back! It was swimming in a bath of delicious flavors for 2 hours at 190 degrees. By the way, the BBQ sauce I used was a finger-lickin’ good Napa Jack’s Sweet & Smoky Bar-B-Q sauce. The sauce was so good, it was hard not to take a spoon and just eat it as is. Can anyone guess the level of success with this third try at sous vide tempeh? Mix a bunch of BBQ sauce with about a tablespoon of oil. Pour it into a bag with the sliced tempeh. Shake it a little bit. Cook tempeh for 2 hours at 190 degrees. Quickly fry tempeh in super hot oil for 1 minute on each side, or until golden. Transfer to plate. Top tempeh with more BBQ sauce. Eat it.